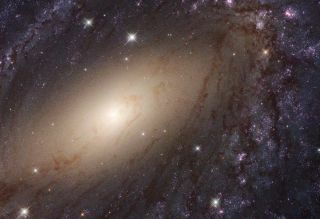 New research may help shed light on why the expansion of the universe is speeding up. A new technique that analyzes clashing observations may help solve the mystery behind the expansion of the universe. The universe doesn't sit calm and placid; it's expanding at an accelerating rate. Why the expansion is speeding up, however, remains a mystery. Some scientists argue that dark energy, the theoretical force that makes up most of the universe, is countering the pull of gravity, while others make the case that Albert Einstein's theory of general relativity itself may need to be modified. Under Einstein's theory, the gravity of the universe appears weaker than scientists expect to see if it is made up of regular matter. To attempt to solve the mystery, a team of researchers is looking not at the universe, but at the data collected by multiple observations — or, more specifically, the inconsistencies in these data. "This is like a detective story, where inconsistent evidence or testimony could lead to solving the puzzle," Mustapha Ishak-Boushaki, a professor of astrophysics at The University of Texas at Dallas, said in a statement. When Einstein was formulating his theory of general relativity, he included the term "gravitational constant" in his equations, to account for a mathematical discrepancy. In 1929, when Edwin Hubble observed that other galaxies moved away from the Milky Way, the idea of an expanding galaxy gained ground. Decades later, in 1998, researchers realized that the expansion was actually speeding up — a discovery that earned them the 2011 Nobel Prize in physics. Since then, evidence has continued to support that acceleration. Astrophysicists rely on a standard model of the universe to describe its history, evolution and structure. This model helps them calculate the age of the universe and the speed of its expansion. Its equations contain several cosmological parameters — variables that are determined by observations. But the numbers for those variables can come from a wide range of experiments, and sometimes, the results of those experiments don't agree. These discrepancies can create systematic errors in data sets and cause uncertainty in the standard model. Ishak-Boushaki and Lin developed a new measure, called the index of inconsistency (IOI), which can assign a numerical value to how much two or more data sets disagree. An IOI of more than 1 means the data sets are inconsistent, while an IOI greater than 5 ranks them as "strongly inconsistent." For example, the Hubble parameter relates to the rate the universe is expanding. Ishak-Boushaki compared five techniques for determining the Hubble parameter. One method relies on measuring the distance to supernovas that lie relatively nearby, while others observe different phenomena at much greater distances. Even more confusing, the multiple methods used to calculate that local method disagree with the Planck results and others. "Why does this local measurement of the Hubble parameter stand out in significant disagreement with Planck?" Ishak-Boushaki said. Ishak-Boushaki and Lin also applied the IOI to five sets of observational tools in the solar system and found that they were in strong disagreement, both with each other and with Planck. The researchers have made their IOI tool available for other scientists to use. "These inconsistencies are starting to show up more now because our observations have progressed to a level of precision where we can see them," said Ishak-Boushaki, who published his first paper about the inconsistencies in 2006. "We need the right values for these cosmological parameters because it has important implications for our understanding of the universe."